The first sign of troubles for the Bristol Bay sockeye salmon run was in 1996. Fishers in Bristol Bay were pleased with a nearly 30 million sockeye harvest, but the Kvichak River inexplicably missed its 4 million escapement goal by 2.5 million fish. Government officials have tried to reassure Western Alaskan fishers that large numbers of salmon are not being netted in international waters. We at BBFA agree that due diligence by U.S. and Canadian Coast Guards has prevented large numbers of salmon from being stolen on the high seas. In an editorial by former Alaskan Governor Murkowski he alluded to problems in the Russian Far East. Murkowski mentioned a report from Moscow that stated that the Russian Fisheries Agency intended to ban other countries from fishing in the Bering Sea, and was drafting a resolution to that effect for the legislature. 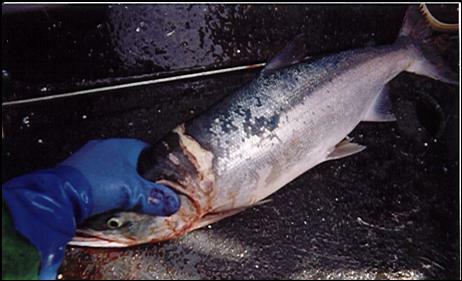 The Senator states, “If true, this development may help discourage overfishing of salmon, as well as other resources”. BBFA is of the opinion that, only when all salmon fisheries are limited to near shore areas in Russia, will Bristol Bay and Western Alaska salmon stocks be free from interceptions. The first sign of troubles for the Bristol Bay sockeye salmon run was in 1996. Fishers in Bristol Bay were pleased with a nearly 30 million sockeye harvest, but the Kvichak River inexplicably missed its 4 million escapement goal by 2.5 million fish. Fishermen commented that they had seen numerous healed, net-marked sockeye in the Bay, a sign of distant water net fisheries. BBFA was dubious that a high seas driftnet style fishery was even occurring, but in time has come to discover that this was, in fact, the sad truth for us. An extensive fishery was quietly initiated inside Russian waters by Japanese driftnet vessels in the 90’s. This fishery has resulted in a one-two knockout punch for fishers and communities in Bristol Bay and Western Alaska. Bristol Bay drift permitholders on average thousands of dollars of income, and losses in value of vessels and permits since 1996. Worse yet, the Kvichak River, the largest producer in Bristol Bay, missed achieving its escapement during several of the past ten years. Communities and fishers continue to cope with these poor returns. In 1991 salmon harvesters throughout Alaska breathed a collective sigh of relief when the Japanese agreed to cease their high seas driftnet fishery after a ban by the United Nations. However, unbeknownst to Western Alaskan fishers, the Japanese were hard at work negotiating new arrangements to carry on with high seas style driftnetting in Russian waters. David Milholland states, “The downturn of the fisheries in Bristol Bay starting in the last half of the 90’s has not been adequately explained by any scientific proof. The increasing pressure on salmon stocks within the Russian 200-mile zone, by the Japanese fleets and others, no doubt, is part of the reason for the decline of the sockeye in Bristol Bay in the minds of knowledgeable fishermen." BBFA obtained documents from the U.S. State Department under the Freedom of Information Act and also has had numerous conversations with government officials and scientists in an attempt to uncover the truth about this fishery and its affect on salmon runs of Western Alaska. We recognize the highly sensitive nature of this issue between the governments of Japan, Russia and the United States. However, BBFA feels that this issue must be fully investigated, and that the unsustainable salmon fishery out to the 200-mile limit of Russia must be halted to protect and sustain Alaska’s valuable Bristol Bay and Western Alaska salmon runs. In 1992, under the Bush administration, David Colson, acting for the Secretary of State, signed a bilateral salmon agreement with the Russian government. The agreement banned U.S. fishers from directed salmon fishing beyond 25 miles of the U.S. coastline. However, in Russian waters, directed salmon fishing was allowed out to the 200-mile Russian EEZ maritime border in all areas south of 60ºN. This left most of the Russian EEZ open to salmon fishing. State Department documents describe a “lingering resentment toward the U.S.” by the Hokkaido, Japan fishing community because of regulations excluding Japan from U.S. waters. A fish cooperative manager stated, according to State Department documents, that the “Alaska fisheries leaders were short sighted in trying to claim the entire Alaska fishery for American boats”. Documents also note that Hokkaido press editorials frequently commented as Japan’s fishing boats were excluded from high seas fisheries, the industry had turned to relying on more agreements with Russia for fish catches in its EEZ. Of particular importance to Western Alaska and Bristol Bay, was the “extension of fishing time in waters off the Kamchatka Peninsula (Area One) in order to match salmon migrations”. Also, in 1997, a new commercial quota was established in Area 3, and the fishing area was enlarged. This area is southwest of Adak, and at the time was known to be a good sockeye salmon fishing area according to State Dept. documents. The rate of sockeye catch was very good that year. This coincides with 1997 when Bristol Bay experienced an “unexplained” loss of 13 million sockeye. Migration routes of Western Alaska salmon are known to extend into Russian waters, according to compilations of tagging studies between 1954 and 1995. This is especially true of the Kvichak sockeye, whose migration route extends furthest to the west of the Bristol Bay sockeye runs. Environmental conditions of the past several years (the negative PDO) may have also contributed to a more westerly grazing pattern and migration route. Since the mid-90’s Bristol Bay fishers have reported high seas type, gillnet-marked sockeye salmon that have returned to the Bristol Bay river systems. Net marks of this type are distinguishable from near-shore net marks that occur with in Alaskan waters. In particular, high seas drift fishermen use monofilament, small-mesh gillnet gear. This gear leaves a different mark than nets used by Alaskan fishers. We are asked over and over, if our theory is correct, why aren’t the sockeye showing up on world markets? We believe that the sockeye are on world markets, but may go unreported. A Russian publication, Gazeta.Ru (10/3/00) (Web Designer add link to Gazet.Ru article here) discussed this problem. According to the article Russia’s Fisheries Committee estimates the damage to Russia by poachers in 1999, amounted to $700 million dollars. The Fishery Committee was especially concerned that the criminals are believed to have close ties with Japanese Mafia structures, the so-called Yakudzi. Committee Chairman Yuri Sinelnik stated, “We have information that several fishing companies have connections with Russian Japanese criminal groups.” He also complained that Japanese authorities effectively turn a blind eye on illicit fish imports from Russian waters. He did not deny the allegations that quite often his own agency officials assist the criminals. We have yet to see any body of evidence that climate or weather is the key cause of the mortality of millions of salmon. The public has been dished up plate after plate of weather and climate fodder that has been used to try to explain the mortality of millions of salmon. Most notable and hard to digest, was the 1997 theory that 13 million salmon died between Port Moeller and Bristol Bay due to very calm and sunny weather. BBFA acknowledges that climate plays an important role in the ecosystem with respect, for example, to fresh water habitat, ice cover, and grazing productivity in the marine environment. However, when salmon are “missing”, and a fishery is occurring in the migration path of these salmon that intercept fishery needs to be fully investigated, so that factual determinations can be made. Pressure must be applied upon Russia and Japan to stop the offshore, directed salmon fisheries extending to the Russian 200-mile limit. U.S. government officials have admitted privately that 10% of Bristol Bay’s run may be being caught within Russian waters. Even at 10% of the Bristol Bay run, the Kvichak system may be severely impacted, due to its westerly migration route. BBFA supports efforts to present this case before the North Pacific Council, and requests that the Council ask for an appropriation from Congress to investigate these allegations. This appropriation would include a NMFS enforcement investigation to locate the salmon in question, both in the Russian EEZ, and in the market destinations. These salmon could be tracked and then identified for nation of origin by appropriate scientific methods. Ultimately, the United States Department of State, along with the appropriate agencies, and related parties, will need to negotiate an agreement whereby a remedy to the problem of interception of transboundary salmon stocks can be achieved. On a personal note, at this time my hands are tied to address this issue most effectively. At the very least, BBFA’s membership, and or contributions, will need to increase substantially. Is there a commitment from permitholders, communities and related parties to work towards mitigating this problem? Net-marked salmon caught in Bristol Bay during the summer gillnet fishery. 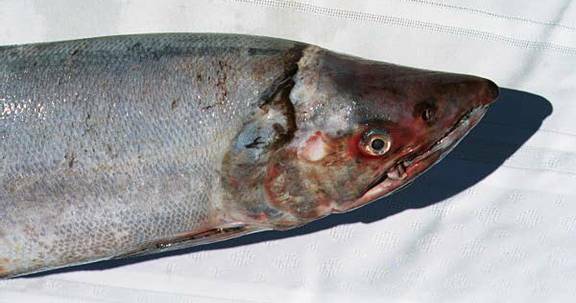 Well-healed net-marked sockeye that may have escaped a foreign net a year earlier. This sockeye appears to have an older, healed net mark, indicating it was caught at a younger age, possibly at age 3. Note that the net mark is close to the nose, demonstrating that a smaller mesh size, possibly 3-4”, was used.